When Should You Begin Harvesting Peppers? Well, that depends. When it comes to harvesting peppers, you must make a choice. 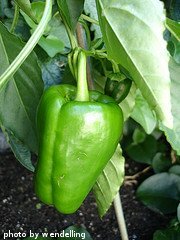 Most peppers turn from green to red if left on the vine. 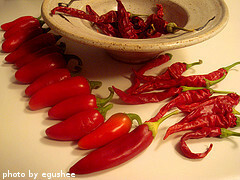 Red peppers are still good to eat, and many times they are more desirable than green peppers. 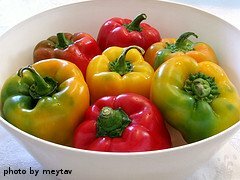 Orange and red bell peppers are much more expensive to buy in a grocery store than green bell peppers. Why is this? Harvesting peppers while they are still green will encourage more fruit production. Waiting to harvest peppers until they are more mature and orange or red will mean less pepper production. As long as you keep picking the fruits when they are still in the immature (or green) stage, the plant will continue to produce more fruit. So you must usually choose between harvesting lots of green peppers or fewer orange and/or red peppers. Most hot peppers are harvested when they turn yellow, orange or red, with the exception of Jalapeno peppers. You can get around this production and quality problem by planting two pepper plants of the same variety. You can continue to pick the green fruit from one of the plants to encourage more pepper production on that plant. You can wait and harvest the peppers on the other plant when they turn the desired color. This way you have the best of both worlds. Most bell pepper varieties taste best when they reach fist-size. If you pick them when the are much smaller than this, you might find that they taste slightly bitter. Hot peppers should be picked when they reach maturity according to the seed packet or seedling tag. If you harvest hot peppers before they reach maturity, they may be overly hot, depending on the variety. Many hot pepper varieties can be harvested while they are still green, as long as they have reached full size. This size depends on the variety of hot pepper. When picking and handling hot peppers, it's a good idea to to use plastic gloves. Some varieties of hot peppers can actually burn your fingers or hands. Make sure not to let the peppers touch any part of your body, especially your eyes, nose or mouth. Also don't touch other parts of your body with the gloves after handling hot peppers. If you happen to let a hot pepper touch your skin and it causes a burning sensation, wash the area thoroughly with soap and water and flush eyes with cool water. 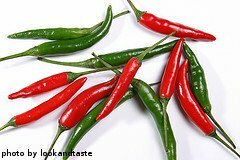 For some hot pepper varieties, the burning sensation may last for several hours. When harvesting peppers, be sure not to damage the plant. It's best to use a knife or shears to cut the plant, leaving a short stem on the fruit. If you just pull on the fruit, you risk breaking off a branch, damaging the fruit or pulling the entire plant out of the ground. After harvesting peppers, it's best to store them for a short time at room temperature. Do not put them in the refrigerator as they don't store well in cold temperatures and may become mushy or mealy. Peppers should usually be eaten within a day or two of harvesting. If you have an abundance of peppers, they can be easily frozen, pickled or dried. To freeze fresh peppers, cut them up into the desired sized pieces and remove the seeds and veins. Place the peppers in an air-tight bag and keep them the freezer. When thawed, the peppers will be slightly soft but will retain their flavor. After the growing season is over, pull the plants up by the roots. Cut them up into smaller pieces and add them to your compost pile.